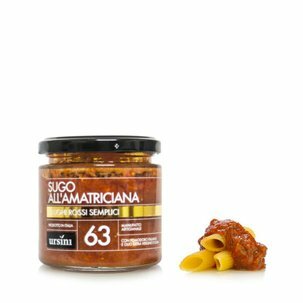 Sciuè sciuè sauce by Ursini is a simple preparation based on traditional recipes. The Neapolitan expression sciuè sciuè refers to the simple and unsophisticated things in life. That's why Ursini's sauce contains just tomato, extra virgin olive oil and basil: a simple sauce that's instantly ready to eat. Heat the sauce gently and pour it over a bowl of freshly cooked pasta. Sprinkle on Parmigiano Reggiano cheese or pecorino to complete this simple and delicious dish. Ingredients Tomato, extra virgin olive oil, basil. For more information on product labels, please contact our Customer Service department. The information on the labels of the products may vary for reasons beyond our control, therefore, there may be discrepancies between the information on the site and that on the products delivered. Please always check the information on the product before consumption or use. The core principle for the Ursini family is their painstaking attention to the original ingredients. 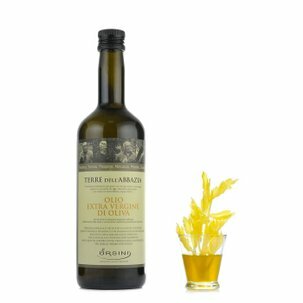 That's why they select only healthy olives, properly ripened, picked by hand and milled the same day for the oil, and mature vegetables processed within a few hours of harvesting to make their vegetable conserves: sauces, creams, and delicacies. New and delicious recipes, in the continuous search for perfection to delight the most attentive consumers.